The Grand Saxophone Ensemble of the Conservatoire National Supérieur de Musique de Paris is made up of the twelve students of the saxophone class. This absolutely exceptional ensemble, whose sound possibilities cover from the small chamber music group to the most astounding sonority of the symphonic orchestra, is immensely successful in each of their performances. Since the very beginning, the aim has been to promote little-known repertoire, as well as some transcriptions, but especially to acquire new repertoire; the world premiere in 1991 of “Linker Augentanz” by Karleinz Stockhausen conducted by the composer was the starting point of this work. The piece combines percussion with a synthesizer. A resounding success! The piece was repeated the same year at the Ars Musica Festival in Bruxelles. Numerous composers take an interest in this original formation: Luciano Berio, Thierry Escaich, Bruno Mantovani, Ton That Tiêt, among others. 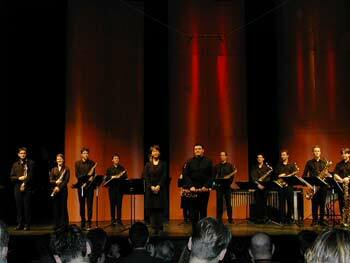 The Ensemble gave performances at the Saxophone World Congresses in Pesaro (1992), Valencia (1997) and Montreal (2000). In 1994, the Ensemble performed live the premiere of Akaïtz by Félix Ibarrondo (commissioned by Radio France ) on France Musique (Les Imaginaires of Jean-Michel Damian). More recently, the Ensemble has offered concerts in Paris but also in Mulhouse , Strasbourg , Limoges , Montpellier , Troyes , Poitiers , where the welcome was especially warm. They played the Chant Sacré by Hector Berlioz in the framework of the Paris events in December 2003 dedicated to the composer, a friend and supporter of Adolphe Sax, and they will perform again in April 2004 at the Bachsaal in Amsterdam . In January 2004, they performed two evenings in a row in Récit by Luciano Berio, as the opening of the concert by the Orchestra of Paris on the occasion of the premiere of Stanze, the last work of the composer at the Théâtre Mogador in Paris . The success of the Ensemble is due to its originality (presenting all the instruments of the family), to its spectacular range of sounds and to the precise and lively conducting, at the same time spectacular and refined, of Kanako Abé. The Ensemble was invited two years in a row (1997 and 1998) to the award-giving ceremony of the Fair Play Prize organised by the Ministry of Youth and Sports and the Association for Sport without Violence Association chaired by André Catelin. Copyright © 2012 Claude Delangle | All Rights Reserved.